Bank of America, Citigroup, JPMorgan and Wells Fargo reported their fourth-quarter earnings and each traded higher. The rebound was driven by oversold technicals and cheap fundamentally. Bank of America Corp. (BAC - Get Report) , Citigroup (C - Get Report) , JPMorgan Chase & Co (JPM - Get Report) and Wells Fargo & Co. (WFC - Get Report) reported their fourth-quarter earnings and each traded higher. All four had a rough 2018, setting all-time or multiyear highs in the first quarter, then landing at Christmas lows in bear market territory. In my judgment, the rebound in these four "too big to fail" money center banks was driven by being oversold technically and becoming cheap fundamentally. According to Macrotrends, each of these big banks have favorable P/E ratios of 9.23 for Citigroup, 10.50 for Wells Fargo, 11.15 for Bank of America and 11.32 for JPMorgan. Their dividend yields are 3.61% for Wells, 3.15% for JPM, 2.93% for Citi and 2.26% for BofA. JPMorgan is the only component of the Dow Jones Industrial Average and the stock ended 2018 with a dividend yield 3.45%, ranked 6th. This made JPM one of the "Dogs of the Dow" for 2019. My focus on the big banks is how to trade them during what I describe as a bear market rally. We know that the unwinding of the Federal Reserve balance sheet has been a drag on banks. We also know that huge global debt is a headwind. And now, Democrat Maxine Waters as chairwoman of the powerful House Financial Services Committee, warns that she wants to re-instate tougher banking regulations targeting the big banks and Wall Street. The weekly chart for Bank of America is positive with the stock above its five-week modified moving average of $26.37. The stock is also above its 200-week simple moving average or "reversion to the mean" at $21.97, which was not tested at the low. The 12x3x3 weekly slow stochastic reading is projected to rise to 37.13 this week up from 25.08 on Jan. 11. 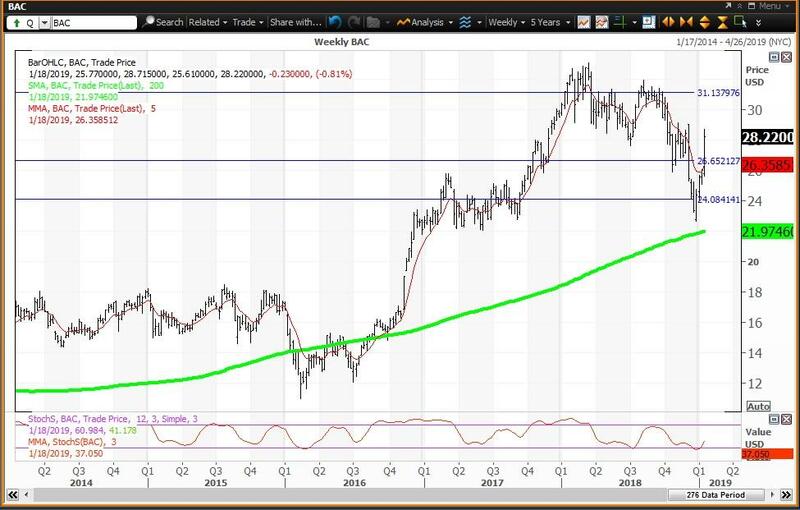 At the end of 2018, and based on the 2018 close of $24.64, the three horizontal levels on the chart formed. My annual value level of $24.07 was tested on Jan. 2 as a buying opportunity. Strength on earnings puts the stock above my semiannual pivot at $26.66. The upside is to my quarterly risky level at $31.13. Trading Strategy: Buy weakness to my semiannual pivot and annual value levels at $26.66 and $24.07 and reduce holdings on strength to my quarterly risky level at $31.13. 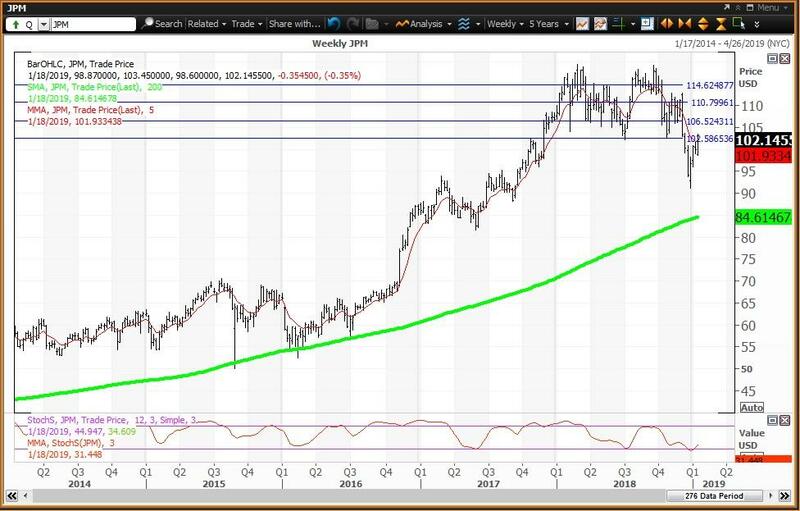 The weekly chart for Citigroup is positive with the stock above its five-week modified moving average of $58.37. The stock was below its 200-week simple moving average or its "reversion to the mean" at $59.05 at the 2018 close of $52.06. The 12x3x3 weekly slow stochastic reading its projected to rise to 25.70 this week, up from 16.27 on Jan. 11, above the oversold threshold of 20.00. When the stock traded as low as $48.42 on Dec. 26, the stochastic reading was below 10.00, making the stock "too cheap to ignore". Based upon the 2018 closes, I have three horizontal lines. My annual pivot is $55.32, which was a magnet as 2019 began. My semiannual pivot is $61.70, which is a magnet this week. My quarterly risky level is $70.38. Trading Strategy: Given the "too cheap to ignore" reading as 2019 began, a long position was justified at my annual pivot at $55.32. Short-term gains can be taken at my semiannual pivot at $61.70. Reduce holdings on to my quarterly risky level at $70.38. 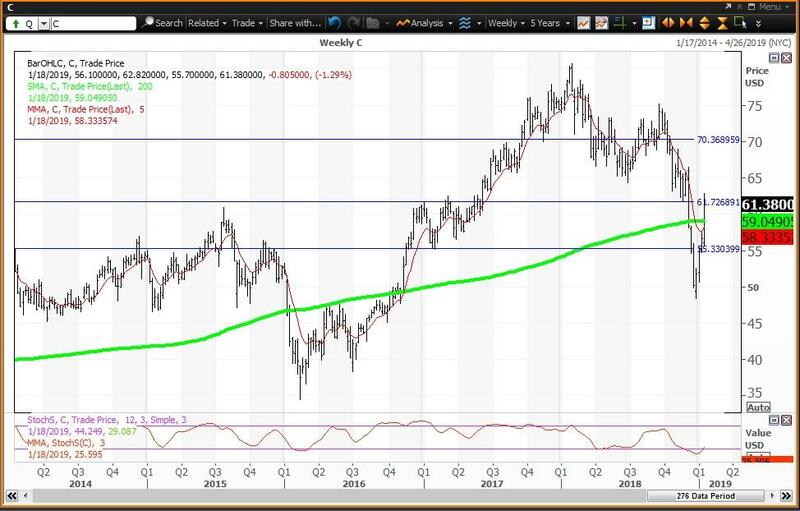 The weekly chart for JPMorgan needs to close above its five-week modified moving average of $101.91 to be positive. The stock is well above its 200-week simple moving average or "reversion to the mean" at $84.61. The 12x3x3 weekly slow stochastic reading is projected to rise to 31.45 this week up from 24.70 on Jan. 11. Based upon its 2018 close of $97.62, I show three chart horizontal levels. My annual pivot at $102.64 has been a magnet this week. My monthly, semiannual and quarterly risky levels are $106.56, $110.75 and $114.59, respectively, so a new high this year seems unlikely. Trading Strategy: A core long position is justified given its dividend and the fact that as 2018 came to an end, the stock was a buy at my 2018 annual value level at $93.20. Reduce holdings if and as the stock climbs into its zone of risky levels. My annual pivot for 2019 is $102.64 and my monthly, semiannual and quarterly risky levels are $106.56, $110.75 and $114.59, respectively. 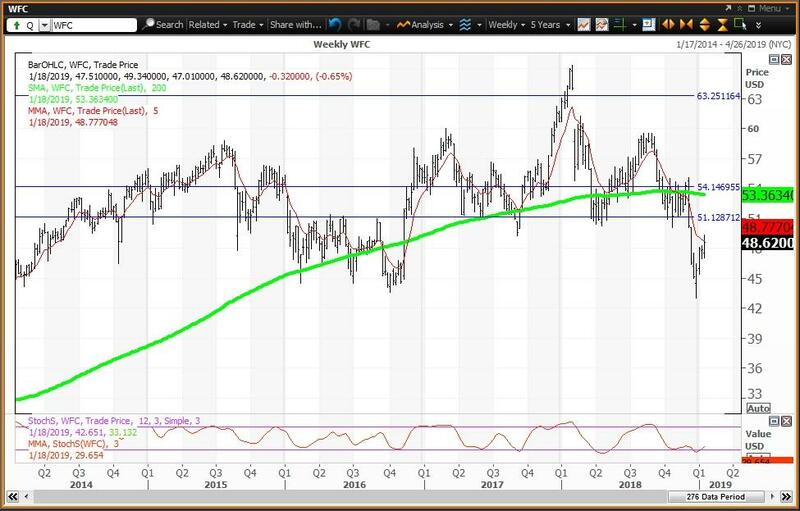 The weekly chart for Wells Fargo needs to close above its five-week modified moving average of $48.80 to have a positive weekly chart. This big bank has been below its 200-week simple moving average or "reversion to the mean" $53.36 since the week of Dec. 7. The 12x3x3 weekly slow stochastic reading is projected to rise to 29.77 this week up from 23.16 on Jan. 11. Based upon its 2018b close at $46.08, I show three horizontal lines as risky levels. The lowest line represents two risky levels, my semiannual and quarterly risky levels at $51.12 and $51.44. My monthly and annual risky levels are $54.14 and $63.29, respectively. Trading Strategy: Reduce holdings on strength to my semiannual and quarterly risky levels at $51.12 and $51.44, respectively. Above are my monthly and annual risky levels at $54.14 and $63.29, respectively.